We move towards having everything connected. More and more things that used to be basic have now been improved with the aid of technology. Security plays an important role and our perspective on that changed as well. One interesting gadget, because it turned into a gadget is the keypad door lock. These little devices transitioned from things such as small safes and onto doors because of how well they work and the added security they offer. Keypad door locks are meant to be extremely straightforward and in some cases, much safer than a regular key lock. Keypad door locks can be found in two different setups. 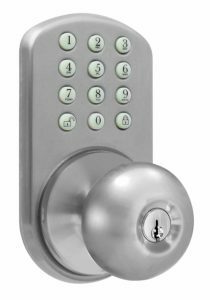 There are keypad door locks that also use a key which means an added layer of security, and regular locks that can only be opened with the keypad. Things do not stop here. Keypad door locks may even have Bluetooth support. 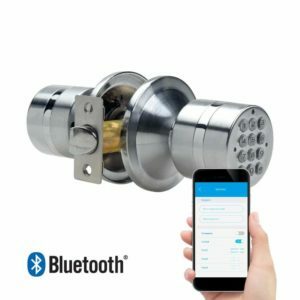 The user can unlock the door if his smartphone has Bluetooth activated and is close enough to actually connect to the door. This keyless access can be convenient but it is not always the most secure one. Most of them are quite easy to install but there are some models that are a bit trickier. If the manual has clear enough instructions, even someone without experience can install a keypad door lock. 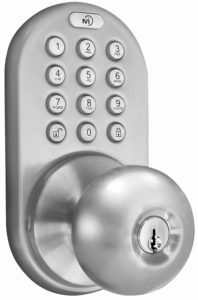 Regardless, there are plenty of different keypad door locks with interesting features and we picked just 10 out of all of them. Because a lock that fails and does not open turns into a major problem, quality and reliability are more important than pricing. 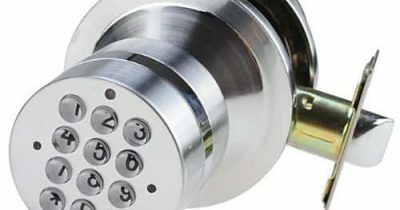 Without any further ado, here is our list of recommendations for the top 10 best keypad door locks in 2019. 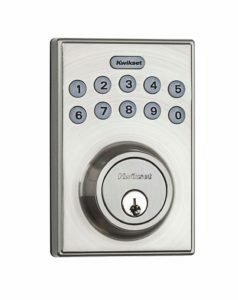 Which Keypad Door Lock To Pick? MiLocks TKK-02SN is a reasonably priced electronic keypad door lock that works well and can be used for all types of doors. It offers keyless entry by just typing it the right code. Setting it up is quite easy and takes only a few seconds. For visibility reasons, the keypad glows in the dark. In terms of installation, the door lock can be placed on left and right handed doors. It is worth mentioning that the door lock also works with keys that are included in the installation kit. The door lock works great. It does not fail at all and it does not require any additional attention once installed. The only issue is that the door lock is not very sturdy. It can be knocked open with just one harder hit. This is why the lock is recommended mostly for interior doors. TurboLock TL-99 is what some would call a smart door lock. It has a useful keyless feature that allows the user to open the lock by just using his smartphone. It also has a keypad lock that can work separately from the Bluetooth authentication system. The lock itself is very sturdy and can be used for exterior doors as it is waterproof and can survive at low or high temperatures. Installation is quite simple and can be done with a screwdriver and a smartphone. The instructions manual is vital when installing and setting up the lock. Sadly, the manual is poorly written and fails at explaining in detail how Bluetooth needs to be set up. The smartphone needs to be paired with the lock before the pin can be setup and the manual is not very helpful. 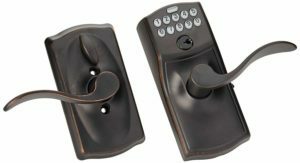 Schlage Camelot is a great keypad door lock that combines a vintage aspect with modern technology. The model offers keyless entry as the lock gets unlocked by just using the keypad. A key can also be used if needed. The lock works with a regular 9-volt battery that comes with the kit and no wiring is required. In terms of build quality, the lock is very sturdy and it is well fitted to be used for exterior doors. It also has a reversible lever which means it can be installed on right and left-hand opening doors. The quality of the battery included is poor at best. It does not last long and replacing it can be annoying. To be safe it is better to just buy another better quality 9-volt battery to avoid having to deal with it too soon after installing the lock. Almost any battery will work as long as it is remotely decent. 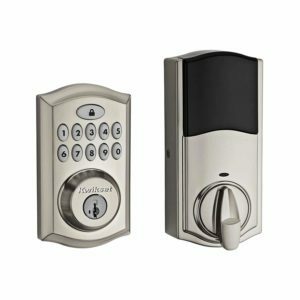 The Schlage Playmouth keypad door lock is quite similar to their Camelot model. In fact, it uses the same electronic board but it has a different design from the outside. It has a curved black handle with bronze accents. At the top, the keypad is placed along with the regular key lock. The unit works with a regular 9-volt battery that is included in the kit. Setting it up is fairly simple. It comes with two 4 digit user codes but they can be changed or replaced with a single 6 digit code. 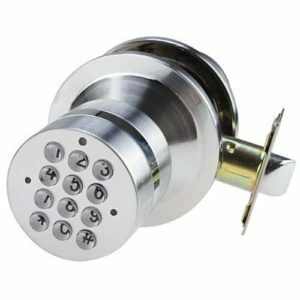 For the price, it is a great keypad door lock. One thing that might seem inconvenient is the fact that the locking timer cannot be set by the user. In fact, there is no option to set the device not to lock once opened after 5 seconds. 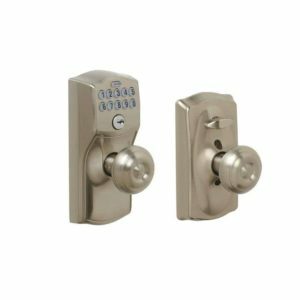 Schlage does offer other models that can be set to not re-lock automatically. 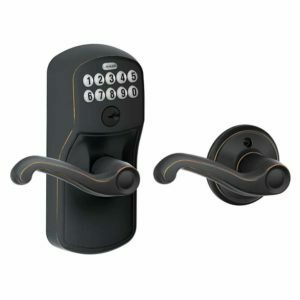 Schalge Camelot is a great looking keypad door lock. It has a minimalistic design with a knob instead of a handle and a small keypad at the top. Similar to their other models, the keypad can use two 4 digit codes or a single 6 digit code. It works with a single 9-volt battery and it is very easy to install and setup. The unit has a bronze finish and fits with pre-existing holes in the door. Also, the lock was designed so that it can be used on left and right-sided doors. Last but not least, this model can lock automatically or remain unlocked. Most regular folks will rely on the user manual for this particular lock. It contains information about how to properly set it up but the steps are poorly described. The user manual is not that helpful but it will be able to provide some basic information on how to install it and set a lock code. Kwiset 99130 is a great little lock that was made to be durable and reliable. The lock has a simple mechanism with a touchpad on the interior and a keypad on the outside. It has a built-in speaker for alerts and supports 10 digit codes. In terms of compatibility, the lock should fit on most doors and should not require additional holes to be drilled. As for build quality, the lock has a steel housing making it a good pick for an exterior door lock. To power it, the lock will need 4 AA batteries. The auto-lock feature is quite useful but some users had issues with it. In some cases, when the auto-lock function is turned on, the unit will keep on attempting to lock the door every 30 seconds over and over. This does not happen with all the units. Most of them do not have this problem. Kwiset 92640 keypad door lock is one of the more basic models on our list. This also makes it quite inexpensive. It is a simple door lock with a keypad at the top and a bottom bracket for a regular key. It allows for keyless access and has a touchpad on the inside that makes it very easy to lock. The kit includes mounting plates and latches that make it work with most doors without the need to drill additional holes. It is a battery powered unit and comes with a low battery notification. The user manual is lacking in terms of information. It was supposed to provide all the steps to install it and set a user code but the indications are very confusing. Most users will find the user manual quite frustrating. It will take a bit of time to figure out how it actually works. MiLocks DKK-02SN offers excellent value for the money. It is a simple lock with a knob and a keypad. Unlike other similar models, this one has metal buttons and was made to work with a regular key or completely keyless. The lock is made entirely out of stainless steel and has a lifetime warranty. It was designed to store up to 6 different user codes. As for compatibility, the door lock was made to work with all the standard door knobs. A useful feature is the fact that the keypad is illuminated, making it easy to see in the dark. The vast majority of keypad door locks have a master password. This means that when someone wants to change a user code, they will need the master one otherwise it will not work. This model does not have such protection mechanism meaning that anyone with access to the lock from the inside, can change the user codes. 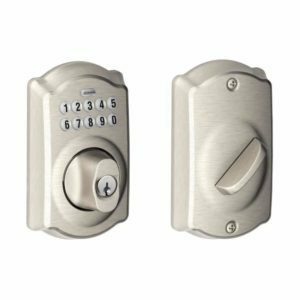 Schlage Camelot keypad with the deadbolt is a simple and compact model. It is very easy to install and has a very stylish design with a brushed metal housing. The keypad is placed on the outside and it is illuminated so that it is visible even in the dark. To set it up, no wiring is required or additional holes. The model can store up to 19 different user codes and has a low battery indicator. Last but not least, the unit comes with a 3-year warranty and can be found in 4 different colors. Being capable to store 19 user codes is great but while most other models support 6 digits, this one is limited to just 4 digits. 4 digit codes are not that secure and people can memorize them easily. Surely this limitation does not make it a bad product; it is just something worth noting. SoHoMiLL electronic keypad lock is one of the most inexpensive and compact models in our list. The entire unit is basically a knob with a keypad on one of the sides. In terms of setup, the model uses a master code and can store 8 different user codes. The construction is quite sturdy with its metal housing. To power it, the unit needs to be plugged into a battery box that uses AAA batteries which are not included. Also, it comes with an auto-lock feature that locks the door in 3 seconds. Almost every keypad door lock has the option to be used with a regular key. Since the manufacturers wanted to make this one as compact as possible and placed the keypad on the knob, there was no room left for a keyhole. If the internal batteries and the batteries from the backup box die, there is no way to open the lock. With or without Bluetooth? The units that can be opened with a mobile device over Bluetooth tend to require more power. They usually need a 9-volt battery. The ones that do not have Bluetooth use AA or AAA batteries but they tend to last much longer. With or without an auto-lock feature: The auto-lock feature can be tricky. For some, it can be useful while for others it can be a genuine pain. It is important to note that not all models can have the auto-locking feature turned off. With or without illuminated keys: Illuminated keys can be useful for exterior doors but they also drain the batteries faster. If there is plenty of light even during the night, a model without an illuminated keypad might be better.